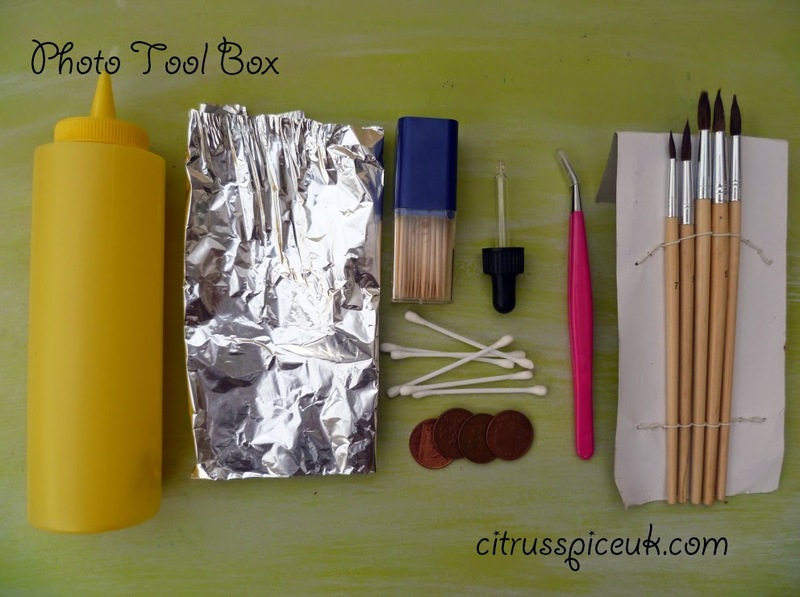 How to make a handy tool box for your food styling . I went to a foodies conference last year and I attended a food photography session.The session was all about how to style your food, how to present it and how to colour coordinate it using accessories, napkins and props. One of the best pieces of advise that was given was to create a tool box for food photography.In this tool box you can place all sorts of handy things that you can use to help with your food styling. Tweezers- these are for placing ingredients and or garnishes in specific position on your food so that they are in the exact place. Cotton buds - these are perfect when you want to mop up a splash or droplets on a plate or side of soup bowl. Kitchen Foil - This is perfect if you want to fill up any cavities at the bottom of a bowl and place food on top.All you need to do is scrunch it in balls and place it in the bottom of the bowl ad place food on top.Scrunched up foil is also ideal to prop up cookies on plates. Loose coins- These are perfect to slide under plates, cups, bowls if you have a little slant to raise the area that's slanting. You can layer them depending on how much raise you want. Pipette - You can use the pipette to add those perfect drops of dressing / sauces on the plate in precision. Brushes -These are good for producing feathered effect and swirling of sauces etc around desserts. Sauce bottle with nozzle- These are perfect as you can fill them with cream or sauce and use the nozzle to release just the exact amount on your plate neatly. Cocktail sticks- These are for lifting , positioning or securing food onto plate. A small spray bottle- Fill the bottle with iced water and use it to freshen up pictures of salad and fruit that may go limp under photography lightening. I am sure that there are many other useful items that can be added to this box and it will grow in due time. Great tips! I would also add a sheet of white paper (to use as a reflector) to the box. Amrita thats a good idea. Thankyou. Richa, putting the tool box is really not hard and once you have all the useful items together , after photo shoot you can make sure you replace in back in the boxfor next time. This is a great idea for a post! I am starting to share more food posts on my blog ( my partner loves to cook and share what he has made) so I will definitely be showing him this post! Thank you. Bex You will have to make him one of these boxes and encourage him to blog about his food. Persephone, actually they are easy to clean just run then under a tap. It's always fascinating to learn about the tricks of any art. Thanks for sharing. 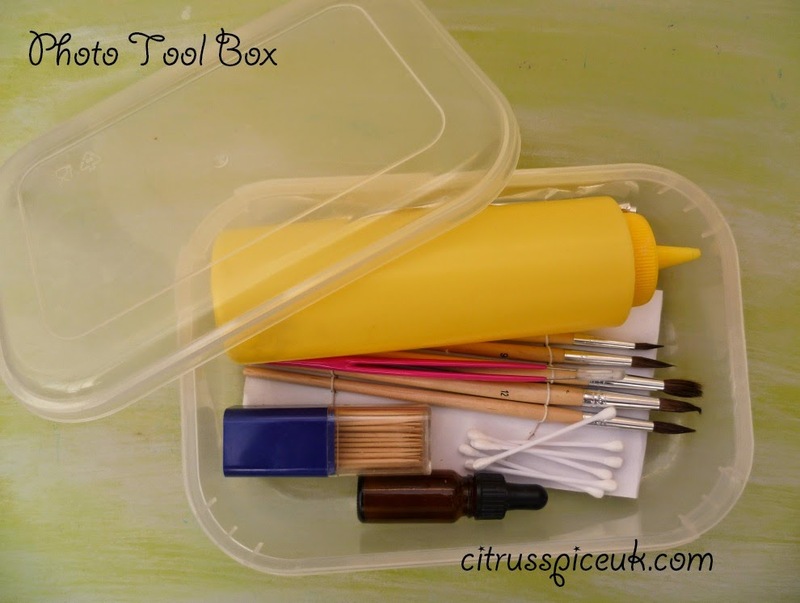 Although I'm not going to take photos of my food any time soon, such a toolbox could come in handy for many other projects, too. This is such an excellent idea. I will certainly use some of the information you gave here. Thank you. Florence so glad you found the post interesting. Great tool box for food styling! Enjoy reading your posts! This is a great kit! Will definitely put one together, I'm always scrabbling round for bit. Lovely post. I hope you do Ren its so useful. *giggles* now I know I am not a food photographer! I just don't do all that stuff and I guess it shows! Fiona I don't suppose its everyones cup of tea but as long as you are happy with how you style that's all that matters.Your pictures are great anyway. What a fab idea - I so need to do this! I hope you do Vanessa. I so need to do this. Having everything in a drawer just isn't working out. Jen its a life saver when you have just plated the food and suddenly you need something. What a great idea. Simple, but incredibly useful! Sophie yes its so useful and when time is the essence when you need to plate and click this tool box is handy if you need to mop up a spill on the plate or readjust a garnish. Oh what a great idea - definitely going to try this! Kate I am sure you won't regret it.Its such a handy little kit. I would never have thought about doing this but after reading about what you can use the different things for it really makes sense to have them all in the same place. What a brilliant idea! It's amazing just how much work goes into food photography. Laurel, you are so right there are so many steps from creating the recipe to getting the ingredients, preparing and cooking, than food styling and photographing it and then writing recipe up and editing photos before the post is finally on blog. Briliant idea! So very handy. Seems like a good idea, never thought of using cotton buds to clean up those sauce dribbles! I used to scrunch up paper towels but they always cleaned up one spill and created another, cotton buds are amazing. This was one bit of advise from FBC that I really put to use. Karen your pictures are awesome this is for newbies like me. great idea, very interesting i would have never tho of it! This is amazing! Such a great idea. I'm terrible with presentation mind you, so no amount of tools will help me. This is a handy little idea and post. I like posts that help me stay organised! I will have to start planing a box of my own! I Have to plan my pictures better - and this will certainly help! 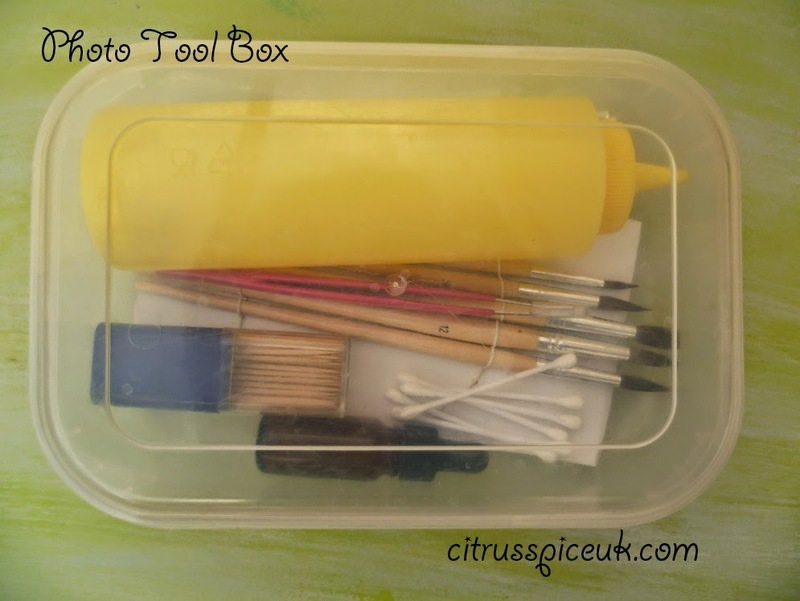 This is a fab post - This is perfect for those who are organised. Thank you for sharing.